The Ockbrook Big Band has been providing top class, 1940s style entertainment to the Midlands and surrounding areas for over twenty years. With a full sixteen piece big band, male and female vocalists and the choice of a full dress outfit of US Air Force uniforms, dinner jackets or our swinging black attire, The Ockbrook Big Band really does provide something special for everyone to enjoy. We have sizes of band to suit all venues and finances. 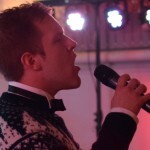 From 8 to the Bar to the mighty 16 piece Band, there is something to suit any event. Our prices are the most competitive in Middle England. From Weddings to Birthdays and Anniversary to Themed party, we are here to give you a night to remember! 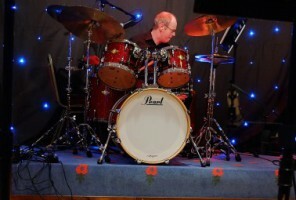 Mark – Having joined the band in 2014, Mark has made a great impression with his authentic sounds and professionalism. A great vocalist and a hit with the audience, Mark continues to provide top quality entertainment throughout the Midlands. He is a big admirer of Matt Monroe. 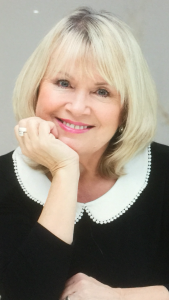 Dee joined OBB early 2018. Singing before she could talk, Dee loves the big numbers as well as the emotive story behind all songs and finds inspiration in all the greats from Etta James to Adele. Dee delights in singing and feels very welcome in the OBB. 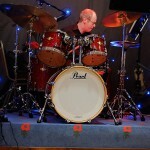 Ian – has previously played drums in various big bands, dance bands, jazz groups and a blues band. 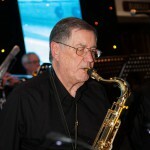 Despite having played many styles of music – from Glenn Miller and Count Basie to Cream, Santana and Earth Wind & Fire – it is the big band sounds which are his favourite. Aside from music, Ian’s other passion is motor racing. He has competed and worked on the organisation side of the sport in past years but now he is a keen spectator. Derek – Derek is an original member of the band, playing bass from its beginning over 20 years ago. Needless to say he knows all the charts backwards and upside down! Derek plays in other bands within the area and also has a sousaphone! 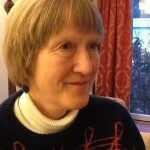 Rosemary – trained at The Royal College of Music in London, where she studied violin, piano and singing. She plays the violin and viola for musical theatre productions and teaches the piano and violin. 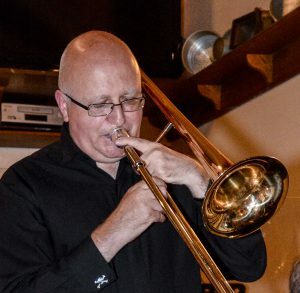 Glenn – Our lead trombone player and accomplished MC, Glenn has been in the band from day one and is widely known as ‘The Musical Undertaker’!!! 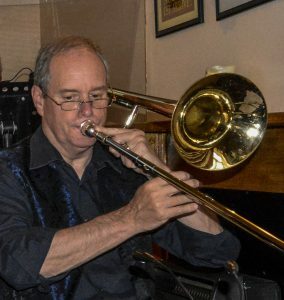 Duncan – Duncan is a stalwart member of our trombone section, having been a member for over 10 years. He trained at the Birmingham School of Music. As a young boy, he was given the choice of learning either the cello or trombone. The trombone won. He loves to listen to Tommy Dorsey. Tim – Our 3rd trombonist. Tim is an early music loving, trombone and sackbut carrying bus passer, with interests in bicycle wheels, beer and the avoidance of domestic lists! 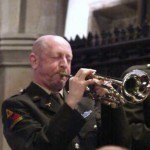 Dave – Our lead trumpet player, Dave is a long standing member of the band. He’s also a fine Flugelhorn player. 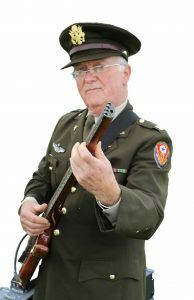 Roy – Professionally a linguist, Roy’s day job before retirement was in the travel trade, and he has sent many a band on concert tours to Europe and the USA, on occasion travelling out with them. His lyrical trumpet or dulcet flugel horn tones have been heard at venues such as in the Netherlands, the Black Forest and the Rhineland. Nigel – After spending 26 years with the Band of the Grenadier Guards and deciding not to make a career of it, he hung up his boots after completing his 25th Trooping the Colour ceremony! On leaving the Forces he decided to move to Spain to run a very successful Karaoke Bar whilst still managing to fit in a few gigs on Sax. 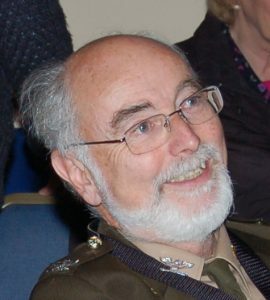 He has worked with many artistes including Sir Cliff Richard, Sir Harry Secombe, Dame Vera Lynn, Catherine Jenkins, Eric Delaney, Harry Connick Jr, Max Bygraves and toured with Hinge and Bracket in the 1980’s. Was once asked by HRH The Duke of Edinburgh if he was touched! 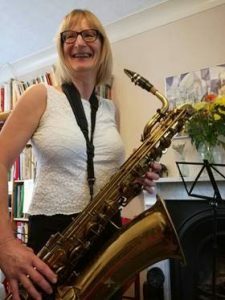 Kath – Tenor 2: Kath loves playing piano, alto, tenor and baritone sax with several local bands and music groups. Non musical interests include short and long distance walking, reading and running a book group, involvement in our local 85 member WI, and keeping track of four children who like to live and work around the world! 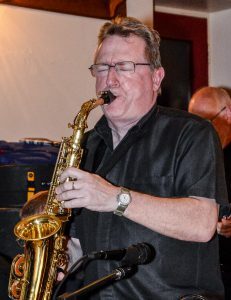 John – Our lead tenor sax player, John plays with a number of local bands in between putting and chipping his way around a golf course or two. Nick – Tenor 2 Having migrated from Yorkshire in the 80s he enjoys life walking the hills and pathways of Derbyshire. He and his wife Elaine both enjoy Ballroom dancing and supporting Derbyshire cricket. A member of Derwent Valley Wind Band, joining OBB recently is an exciting step forward. 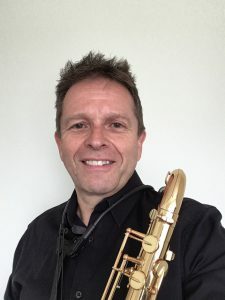 Peter – Peter plays baritone sax with several bands from quartets to 50 piece ensembles and has even had a guest appearance with the National Saxophone Choir, but OBB always comes first in his eyes.